Hi Bill, the way you are building and put building up at your place, you should be done build by next summer. I have a snowmobile ready for you to use. You can add the charcoal gasifier to it!! I think that would be a first at least on this site. You could actually sled mount it. I want to mount a charcoal gasifier on my 4 wheeler. If you trailer mount it, you can swap the ski’s out for wheels. and vice versa… However, it has it’s own drawbacks of like not being able to haul another trailer. I can just mount it on the back rack. But likely I would make a sort of gimble hook. A little heat on your back side from the Gasifier would be kinda nice in the cold too. A Mount bracket might be nice so you can swap systems out without needing much downtime to frog around with it when you have work to get done and you want to use it. One of my friends was up here hunting this weekend. This is the last weekend for rifle hunting. He askem if I wanted the deer. He was leaving so I had to make up my mind quickly. I called a neighbor to see if he wanted half if he show me how to cut up a deer. That’s right, I’ve never been hunting. My neighbor agreed so I hung the deer in my garage until Monday. It’ll be like getting paid to learn. 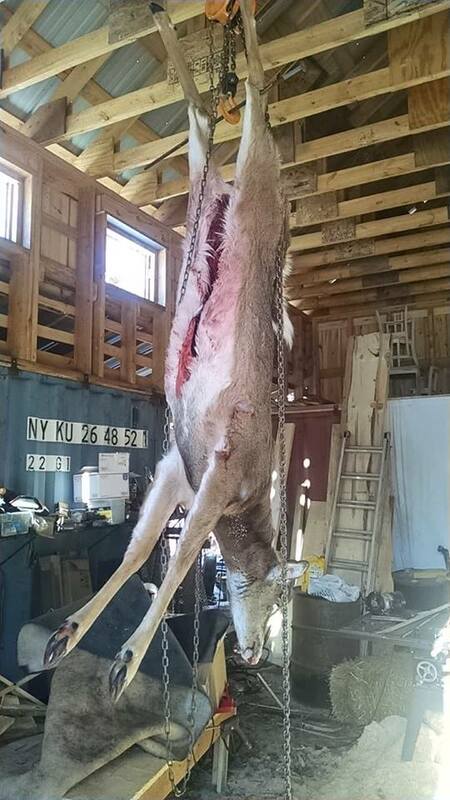 That looks like a nice white tail deer, very good eating. You can sharpen your knife while you watch the Vikings lose tonight. You will have fun, and have some nice lean meat for the winter. Hope its a little warmer, 7 degrees for our opening day here in Wisconsin. Lovin all progress on your place in the woods. Hopefully they win. They lions won today funny things can happen. I think Bill just needs to wear those nice horns for good luck like a die hard Vikings fan. I’m a fair weather Vikings fan. Not really much into overpaid athletes. I will watch if they’re in the playoffs. 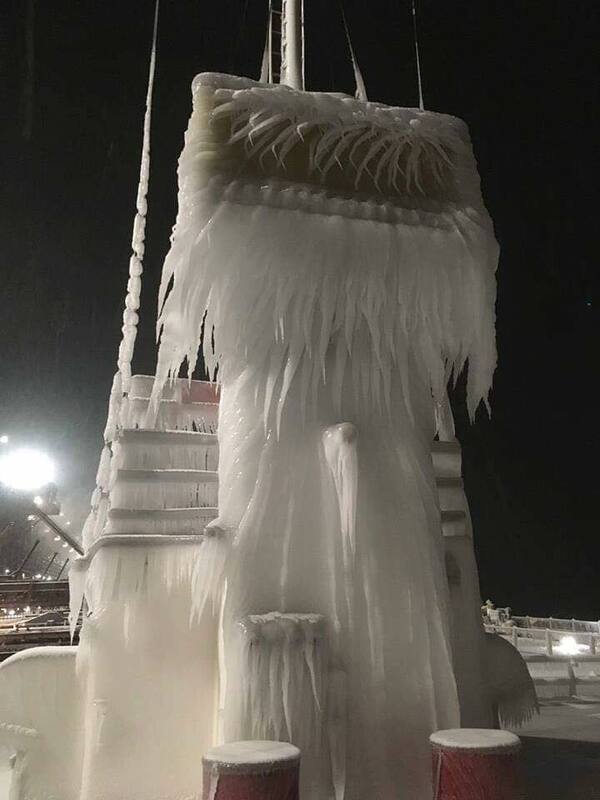 This is a ship at the ore docks in Two Harbors November 19th. Is it always 5- 10 degrees warmer than where we live because the lake keeps it warmer. It’s here to load up with iron ore.
That looks like the ghost of the Edmond Fitzgerald!! The only neighbor I have on our 3 mile road. Yesterday we ground up venison. 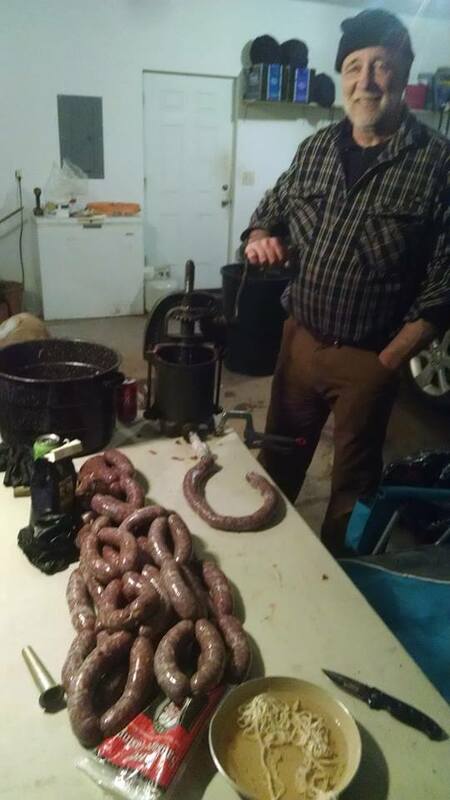 Today him and I ground up some pork and made sausage. Tomorrow we will smoke it all for 12 hours. Luke killed a deer the other day too/. First day out after about 10 minutes. Was going to upload a picture, but can’t find the adapter cable. Maybe later. They sure do help on the grocery bill. Tom, I had to look this up. Yes, I have had many old men in my life and appreciate the info I collected from them. Still, to this day, old men are my favorite people to talk to. One day I will be one, hopefully. This neighbor in the picture has never made sausage. He was a little reluctant to try it but all the meat we used was mine, so he had nothing to lose except time. By the end of the day, he was happy with what we accomplished. I made sausage with a stuffer like this when I was a kid. I’m glad I could share this experience with someone who has never tried it before. The theory and application of Old Men was an article that I first read in field and stream or outdoor life magazines. Let’s just say that was a couple of decades ago. Whenever I see people interact with old men it brings back memories of the article and most importantly of my Great Uncle Boots who took me hunting fishing and trapping.